Cortland – Thomas M. “Tom” Orfin, 71, of Cortland, passed away unexpectantly on Sunday evening from a heart attack. Tom will always be remembered and loved by his family and friends for his kindness, generosity, and the way he always put others ahead of himself. He was often referred to as “The Gentle Giant” by so many for his strong and big stature. He was born March 25, 1947 in Warren, the son of John and Mary (David) Orfin and was a lifelong area resident. Tom was a 1965 graduate of Warren G. Harding High School and a member of SS. Peter & Paul Byzantine Catholic Church. He proudly served his country in the United States Army during the Vietnam War serving over seas in Thailand. Tom earned the rank of Specialist E-4 and was awarded the following decorations for his service to his country, National Defense Service Medal and the Good Conduct Medal. Tom started his career for over 20 years at Ajax Magnathermic Company wiring furnaces until their closure and then he was employed for over 25 years with the Lakeview School System as a custodian retiring in 2010. All throughout his career he was also extremely proud to have his own antique business for over 40 years dealing at many flea markets throughout the area. Tom had many passions throughout his life. 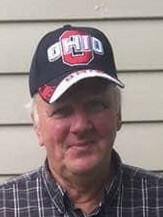 He enjoyed collecting antique toys, was an avid sports fan of all Cleveland teams, spending time at the flea markets, and going to the casino with his wife hoping to hit the big jackpot. Tom was also a true family man by coaching his son’s little league baseball team and being a caregiver to his wife during her recovery from a recent surgery. Tom leaves behind to hold onto his precious memories his beloved wife of over 48 years the former Bonnie Lickwar whom he married May 9, 1970 at SS. Peter & Paul Byzantine Catholic Church, a son Brian (Melissa) Orfin of Cortland, the apple of his eye his grandson Andy, who referred to him as “papa Tom and PT”, his favorite pet grand dog Petey, two brothers David (Diana) Orfin of Las Vegas and Albert Orfin of Warren and a sister Barbara (Robert) Retort of Hermitage, Pa.
Family and friends may pay their respects on Thursday, January 24, 2019 from 4:00 pm until 7:00 pm at the Sinchak & Sons Funeral Home, 727 E. Market St., Warren, where a Parastas Prayer Service will be held at 4:00 pm. There will be a prayer service held on Friday, January 25, 2019 at 9:30 am at Sinchak & Sons Funeral Home, Warren followed by a Funeral Divine Liturgy at 10:00 am at SS. Peter & Paul Byzantine Catholic Church, 180 Belvedere Ave. NE, Warren with Fr. Simeon B. Sibenik officiating. Burial will take place at SS. Peter & Paul Byzantine Cemetery, Warren. Family and friends may visit www.sinchakandsons.com to view this obituary, sign the guest book or send condolences to the Orfin family. In lieu of flowers material contributions may be made in Tom’s name to Animal Welfare League of Trumbull County, 812 Youngstown Kingsville Rd. SE, Vienna, Ohio 44473.